Kathryn Fingar, Ph.D., M.P.H., and Raynard Washington, Ph.D. This Healthcare Cost and Utilization Project (HCUP) Statistical Brief examines trends from 2009 through 2013 for all readmissions following an admission for any cause, as well as for readmissions following an admission for four high-volume conditions targeted by the HRRP: AMI, CHF, COPD, and pneumonia. Readmission was defined as a subsequent hospital admission for any cause within 30 days following an initial hospital admission, referred to as the index stay. Because all-cause readmissions were examined, readmissions may or may not be related to the primary reason for admission during the index stay. Trends in the rate and aggregate cost of readmissions were examined overall and by expected payer of the index stay. Therefore, the expected payer of the readmission may be different from that of the index stay. Aggregate costs are those for the readmission only, not counting the cost of the index stay. Differences of greater than 5 percent are noted in the text. Table 1 presents conditions with at least 250,000 index stays that had the highest rate of readmission for all causes within 30 days in 2013. The four highlighted conditions—AMI, CHF, COPD, and pneumonia—are the focus of this Statistical Brief. In 2013, there were about 500,000 readmissions totaling $7 billion in aggregate hospital costs for four high—volume conditions—acute myocardial infarction (AMI), congestive heart failure (CHF), chronic obstructive pulmonary disease (COPD), and pneumonia. Among initial hospital stays (index stays) for AMI, CHF, COPD, and pneumonia, the aggregate cost of readmissions in 2013 was $5.2 billion for Medicare—74 percent of the aggregate cost of readmissions for these four conditions. From 2009 to 2013, the readmission rate for stays covered by Medicare decreased by 13 percent for AMI, by 7 percent each for CHF and COPD, and by 6 percent for pneumonia. Overall, the largest decrease in readmission rate from 2009 to 2013 was for AMI (by 13 percent, from 16.9 to 14.7 readmissions per 100 index stays for AMI). Although the rate declined overall (across payers), the aggregate cost of readmissions following an index stay for AMI decreased only among index stays covered by private insurance (by 18 percent). Although Medicare was the only payer for which the rate of readmission for pneumonia decreased from 2009 to 2013, the aggregate cost of readmissions for pneumonia decreased for all payers, by 6-26 percent. The aggregate cost of readmissions following an index stay for any of the four conditions decreased from 2009 to 2013 for all payers, except the uninsured whose rate remain unchanged. The largest declines were for index stays paid by private insurance (22 percent) and Medicare (9 percent). Notes: Only conditions with greater than 250,000 index stays are shown. Principal diagnosis is based on the Clinical Classifications Software (CCS). Costs include those of the readmission only, excluding the cost of the index stay. AMI, CHF, COPD, and pneumonia accounted for 13 percent of all readmissions, as well as 13 percent of aggregate hospital costs for readmissions in 2013. In 2013, there were 496,502 readmissions following an index stay for AMI, CHF, COPD, or pneumonia, accounting for 13 percent of all readmissions. Aggregate hospital costs for readmissions following an index stay for any of these four conditions totaled $7.0 billion—13 percent of aggregate costs for all readmissions. Readmission rates for AMI, CHF, COPD, and pneumonia were more than 5 percent higher than the overall readmission rate of 13.9 per 100 index stays. The rate of readmission following an index stay for CHF was the highest (23.5 per 100 index stays) among high-volume conditions with at least 250,000 index stays and was 69 percent higher than the rate of readmission overall (13.9). The rate of readmission was 20.0 per 100 index stays for COPD and 15.5 per 100 index stays for pneumonia—44 and 12 percent higher, respectively, than the rate of readmission overall. The rate of readmission for AMI (14.7) was 6 percent higher than the overall readmission rate in 2013. Figure 1 presents trends in the rate of readmissions for any cause within 30 days, per 100 index stays, overall and for four high-volume conditions from 2009 through 2013. Figure 1. All-cause rate of readmission, by principal diagnosis of index admission, 2009-2013. 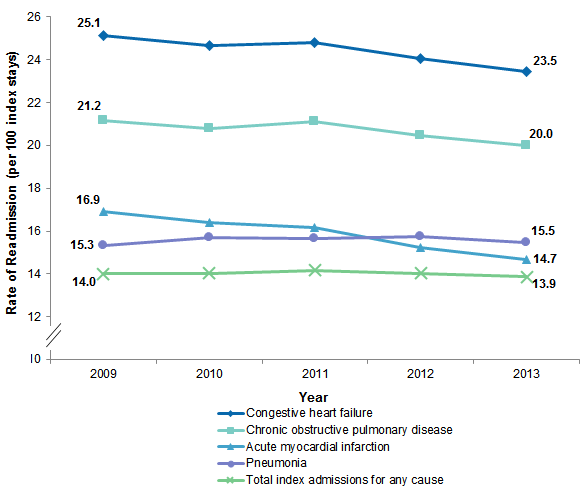 Figure 1 shows the rate of readmission from 2009 through 2013 for acute myocardial infarction, congestive heart failure, chronic obstructive pulmonary disease, and pneumonia, and for all index admissions for any cause. The rate of readmission for congestive heart failure was 25.1 in 2009, 24.7 in 2010, 24.8 in 2011, 24.0 in 2012, and 23.5 in 2013. The rate of readmission for chronic obstructive pulmonary disease was 21.2 in 2009, 20.8 in 2010, 21.1 in 2011, 20.5 in 2012, and 20.0 in 2013. The rate of readmission for acute myocardial infarction declined steadily from 16.9 in 2009 to 14.7 in 2013. The rate of readmission for pneumonia was 15.3 in 2009, 15.7 in 2010, 15.6 in 2011, 15.7 in 2012, and 15.5 in 2013. And the rate of readmission for total index admissions for any cause was 14.0 in 2009 and 2010, 14.2 in 2011, 14.0 in 2012, and 13.9 in 2013. The percentage of index stays with AMI that were readmitted for any cause within 30 days decreased by 13 percent from 2009 through 2013. From 2009 through 2013, the rate of readmission following index stays for AMI decreased by 13 percent, from 16.9 to 14.7 per 100 index stays. By 2013, the readmission rate following AMI was only 6 percent higher than the overall readmission rate of 13.9 per 100 index stays (vs. 21 percent higher in 2009). The rate of readmission for index stays with CHF or COPD decreased by 6 percent from 2009 through 2013. From 2009 through 2013, the rate of readmission following index stays decreased by 6 percent for CHF (from 25.1 to 23.5 per 100 index stays) and for COPD (from 21.2 to 20.0 per 100 index stays). The overall readmission rate and the readmission rate for pneumonia remained relatively stable from 2009 through 2013. Table 2 presents trends in the 30-day all-cause readmission rate following index admissions for four high-volume conditions, by expected payer of the index stay, in 2009 and 2013. Note: Principal diagnosis grouped according to the Clinical Classifications Software (CCS). Data by payer do not add to the column total because other payers are not shown. In 2009 and 2013, index stays paid by Medicare accounted for over 75 percent of readmissions for AMI, CHF, COPD, and pneumonia, and had higher readmission rates than any other payer, except for Medicaid. Of all readmissions following an index stay for AMI, CHF, COPD, or pneumonia, over 75 percent had Medicare as the expected payer for the index stay in both 2009 and 2013. The rate of readmission for any of these four high-volume conditions among index stays with Medicare as the expected payer was nearly twice the rate among index stays with private insurance (20.3 vs. 11.7 per 100 index stays in 2013). In 2013, the rate of readmission for these four conditions also was high among index stays with Medicaid (20.5); it was lowest among uninsured index stays (11.0). The total rate of readmission associated with index stays for any of the four conditions examined decreased for all payers, except index stays paid by Medicaid. The readmission rate among index stays for AMI, CHF, COPD, and pneumonia combined decreased by 7.9 percent for index stays paid by Medicare and by 5.8 percent for index stays paid by private insurance. The rate also decreased among uninsured index stays, although not by more than 5 percent. 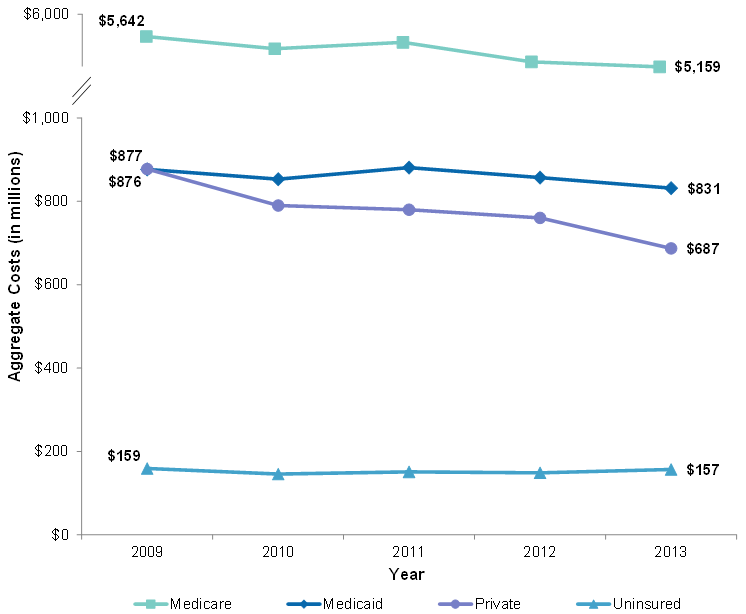 Medicaid was the only payer for which the readmission rate did not decrease from 2009 through 2013. The readmission rate decreased by more than 5 percent for each of the four high-volume conditions for index stays paid by Medicare. From 2009 through 2013, among index stays with Medicare as the expected payer, the rate of readmission decreased by 13 percent for AMI, by 7 percent each for CHF and COPD, and by 6 percent for pneumonia. Medicare was the only expected payer for which the rate of readmission decreased for all four conditions. From 2009 through 2013, the rate of readmission following an index stay for AMI decreased by over 10 percent for all expected payers. Private payers experienced the greatest decrease in the rate of readmission associated with AMI, by 18 percent, from 10.4 readmissions per 100 index stays in 2009 to 8.5 per 100 index stays in 2013. The rate of readmission following AMI decreased by 13 percent among index stays covered by Medicare and among uninsured index stays, and by 11 percent among index stays covered by Medicaid. The rate of readmission following an index stay for CHF decreased by over 5 percent for all expected payers except Medicaid. The rate of readmission for CHF decreased by 8 percent among index stays covered by private insurance, by 7 percent among index stays with Medicare, and by 6 percent among uninsured index stays. The decrease in the CHF readmission rate was less than 5 percent for Medicaid. From 2009 through 2013, the rate of readmission following an index stay for pneumonia increased by 13 percent for uninsured stays and by 11 percent for stays covered by Medicaid. The rate of readmission following an index stay for pneumonia remained stable at around 15.5 per 100 index stays overall. However, of the four high-volume conditions examined, pneumonia was the only condition for which the readmission rate increased by over 5 percent for any payer. This increase was highest among uninsured index stays, from 7.9 readmissions per 100 index stays in 2009 to 8.9 per 100 index stays in 2013 (a 13 percent increase), followed by index stays with Medicaid as the expected payer (an 11 percent increase). Medicare was the only payer for which the readmission rate associated with pneumonia decreased (by 6 percent). Figure 2 presents the inflation-adjusted aggregate costs for readmissions for four high-volume conditions, by expected payer of the index stay, from 2009 through 2013. Notes: All costs are inflation adjusted using the price index for the gross domestic product and expressed in 2013 dollars. Costs include those of the readmission only, excluding the cost of the index stay. Figure 2. Inflation-adjusted aggregate costs for readmissions for any cause following an index stay for AMI, CHF, COPD, or pneumonia, by expected payer of the index stay, 2009-2013. Figure 2 shows inflation-adjusted aggregate costs for readmissions for any cause after an index stay for acute myocardial infarction, congestive heart failure, chronic obstructive pulmonary disease, or pneumonia from 2009 through 2013 by expected payer of the index stay. Aggregate costs of readmissions for index stays paid by Medicare were $5,642 million in 2009, $5,448 million in 2010, $5,551 million in 2011, $5,239 million in 2012, and $5,159 million in 2013. Aggregate costs of readmissions for index stays paid by Medicaid were $876 million in 2009, $853 million in 2010, $881 million in 2011, $857 million in 2012, and $831 million in 2013. Aggregate costs of readmissions for index stays paid by private insurance declined steadily from $877 million in 2009 to $687 million in 2013. Aggregate costs of readmissions for index stays that were uninsured were $159 million in 2009, $146 million in 2010, $151 million in 2011, $149 million in 2012, and $157 million in 2013. In 2013, the aggregate cost of readmissions for AMI, CHF, COPD, and pneumonia totaled $5.2 billion among index stays with Medicare. Among index stays for AMI, CHF, COPD, and pneumonia with Medicare as the expected payer, the aggregate cost of readmissions, excluding the cost of the index stay, totaled $5.2 billion, more than 6 times the aggregate cost of readmissions for index stays with Medicaid or private insurance. Overall, the aggregate cost of readmissions following an index stay for any of the four conditions decreased for all payers. The largest declines were among index stays paid by private insurance (22 percent) and by Medicare (9 percent). From 2009 through 2013, the inflation-adjusted aggregate cost of readmissions among index stays for AMI, CHF, COPD, and pneumonia that were expected to be paid by private insurance decreased 22 percent, from $877 to $687 million. The aggregate cost of readmissions for these four conditions over the 5-year time period also decreased among index stays paid by Medicare (by 9 percent from $5,642 to $5,159 million) and among index stays paid by Medicaid (by 5 percent from $876 to $831 million). Aggregate costs remained relatively stable for uninsured index stays, decreasing by less than 5 percent. Table 3 presents inflation-adjusted aggregate costs for readmissions for four high-volume conditions, by principal diagnosis and expected payer of the index stay, in 2009 and 2013. Notes: Principal diagnosis grouped according to the Clinical Classifications Software (CCS). All costs are inflation adjusted using the price index for the gross domestic product and expressed in 2013 dollars. Costs include those of the readmission only, excluding the cost of the index stay. Data by payer do not add to the column total because other payers are not shown. The aggregate cost of readmissions following an index stay for AMI decreased by 18 percent for index stays paid by private insurance. The inflation-adjusted aggregate cost of readmissions following index stays for AMI with private insurance as the expected payer decreased from $183.7 to $151.5 million from 2009 through 2013 (by 18 percent). The aggregate cost of readmissions associated with AMI did not change by more than 5 percent for other expected payers. The aggregate cost of readmissions for CHF decreased by 20 percent among index stays paid by private insurance and by 9 percent among those paid by Medicare. From 2009 through 2013, the aggregate cost of readmissions following an index stay for CHF decreased by 20 percent among index stays with private insurance as the expected payer (from $317.0 to $252.4 million) and by 9 percent among index stays with Medicare as the expected payer (from $2,249.6 to $2,055.9 million). By contrast, aggregate costs for readmissions following an index stay for CHF increased by 10 percent among index stays with no insurance (from $50.9 to $56.2 million). From 2009 through 2013, the aggregate cost of readmissions for COPD decreased by over 5 percent among all expected payers except Medicaid. The aggregate cost of readmissions following an index stay for COPD decreased by 23 percent among uninsured index stays, by 22 percent among index stays with private insurance as the expected payer, and by 13 percent among index stays with Medicare as the expected payer. There was no substantial change in the aggregate cost of readmissions following index stays for COPD with Medicaid. The aggregate cost of readmissions for pneumonia decreased by over 5 percent among all expected payers. The aggregate cost of readmissions following an index stay for pneumonia decreased for all expected payers: by 26 percent among index stays paid by private insurance, by 12 percent among index stays paid by Medicaid, by 8 percent among index stays paid by Medicare, and by 6 percent among uninsured index stays. Aggregate costs of readmissions following an index stay with private insurance decreased by more than 17 percent for each of the four high-volume conditions examined. The aggregate cost of readmissions following an index stay with private insurance as the expected payer decreased between 18 and 26 percent for each of the four conditions examined (decrease of 18 percent for AMI, 20 percent for CHF, 22 percent for COPD, and 26 percent for pneumonia). These conditions were chosen because they are used to calculate readmission rates and penalty payment adjustments by the Centers for Medicare & Medicaid Services (CMS) Hospital Readmissions Reduction Program (HRRP). The HRRP also considers readmissions for index stays involving hip and knee replacements, which we did not examine in this Statistical Brief because these types of stays are identified using procedure rather than diagnosis codes. It should be noted that our estimates may differ from Medicare readmission rates computed using other data sources. The CMS HRRP uses a different algorithm to identify conditions.10 There may also be differences in the inclusion of beneficiaries with Medicare fee-for-service or Medicare Advantage and beneficiaries dually enrolled in Medicare and Medicaid. These groups are included in the Medicare estimates in this Statistical Brief. As shown in Table 4, despite these potential differences the rates of readmission following index stays for AMI, CHF, and pneumonia that were expected to be paid by Medicare, as reported in this Statistical Brief using HCUP data, are consistent with an analysis conducted by the Kaiser Family Foundation11 using CMS Hospital Compare data (the latter did not report COPD readmission rates). The 30-day readmission rate is defined as the number of admissions for each condition for which there was at least one subsequent hospital admission within 30 days, divided by the total number of admissions from January through November of the same year. That is, when patients are discharged from the hospital, they are followed for 30 days in the data. If any readmission to the same or different hospital occurs during this time period, the admission is counted as having a readmission. No more than one readmission is counted within the 30-day period, because the outcome measure assessed is "percentage of admissions that are readmitted." If a patient was transferred to a different hospital on the same day or was transferred within the same hospital, the two events were combined as a single stay and the second event was not counted as a readmission; that is, transfers were not considered a readmission. In the case of admissions for which there was more than one readmission in the 30-day period, the data presented in this Statistical Brief reflect the characteristics and costs of the first readmission. Every qualifying hospital stay is counted as a separate initial (starting point) admission. Thus, a single patient can be counted multiple times during the course of the January through November observation period. In addition, initial admissions do not require a prior "clean period" with no hospitalizations; that is, a hospital stay may be a readmission for a prior stay and the initial admission for a subsequent readmission. Admissions were disqualified from the analysis as initial admissions if they could not be followed for 30 days for one of the following reasons: (1) the patient died in the hospital, (2) information on length of stay was missing, or (3) the patient was discharged in December. The Nationwide Readmissions Database (NRD) is based on data from community hospitals, which are defined as short-term, non-Federal, general, and other hospitals, excluding hospital units of other institutions (e.g., prisons). The NRD includes obstetrics and gynecology, otolaryngology, orthopedic, cancer, pediatric, public, and academic medical hospitals. Excluded are long-term care facilities such as rehabilitation, long-term acute care, psychiatric, and alcoholism and chemical dependency hospitals. However, if a patient received long-term care, rehabilitation, or treatment for psychiatric or chemical dependency conditions in a community hospital, the discharge record for that stay will be included in the NRD. Total hospital charges were converted to costs using HCUP Cost-to-Charge Ratios based on hospital accounting reports from CMS.12 Costs reflect the actual expenses incurred in the production of hospital services, such as wages, supplies, and utility costs; charges represent the amount a hospital billed for the case. For each hospital, a hospital-wide cost-to-charge ratio is used. Hospital charges reflect the amount the hospital billed for the entire hospital stay and do not include professional (physician) fees. For the purposes of this Statistical Brief, costs are reported to the nearest hundred thousand. Annual costs were inflation adjusted using the Gross Domestic Product (GDP) Price Index from the U.S. Department of Commerce, Bureau of Economic Analysis (BEA), with 2013 as the index base.13 That is, all costs are expressed in 2013 dollars. Hospital stays billed to the State Children's Health Insurance Program (SCHIP) may be classified as Medicaid, Private Insurance, or Other, depending on the structure of the State program. Because most State data do not identify SCHIP patients specifically, it is not possible to present this information separately. For this Statistical Brief, categorization of readmission counts and costs by expected payer was based on the index stay. The concordance between the expected payer coded at the index stay and the expected payer coded at readmission varies by payer: 98 percent for Medicare, 95 percent for Medicaid, 93 percent for private, and 80 percent for uninsured (percentages based on the 2013 NRD). The Healthcare Cost and Utilization Project (HCUP, pronounced "H-Cup") is a family of health care databases and related software tools and products developed through a Federal-State-Industry partnership and sponsored by the Agency for Healthcare Research and Quality (AHRQ). HCUP databases bring together the data collection efforts of State data organizations, hospital associations, and private data organizations (HCUP Partners), and the Federal government to create a national information resource of encounter-level health care data. HCUP includes the largest collection of longitudinal hospital care data in the United States, with all-payer, encounter-level information beginning in 1988. These databases enable research on a broad range of health policy issues, including cost and quality of health services, medical practice patterns, access to health care programs, and outcomes of treatments at the national, State, and local market levels. The HCUP Nationwide Readmissions Database (NRD) is a calendar-year, discharge-level database constructed from the HCUP State Inpatient Databases (SID) with verified patient linkage numbers that can be used to track a person across hospitals within a State. The 2013 NRD is available for purchase through the HCUP Central Distributor. The NRD is designed to support various types of analyses of national readmission rates. The database includes discharges for patients with and without repeat hospital visits in a year and those who have died in the hospital. Repeat stays may or may not be related. The criteria to determine the relationship between hospital admissions is left to the analyst using the NRD. The NRD was constructed as a sample of convenience consisting of 100 percent of the eligible discharges. Discharge weights for national estimates are developed using the target universe of community hospitals (excluding rehabilitation and long-term acute care hospitals) in the United States. Over time, the sampling frame for the NRD will change; thus, the number of States contributing to the NRD will vary from year to year. The NRD is intended for national estimates only; no regional, State-, or hospital-specific estimates can be produced. Fingar K (Truven Health Analytics), Washington R (AHRQ). Trends in Hospital Readmissions for Four High-Volume Conditions, 2009-2013. HCUP Statistical Brief #196. November 2015. Agency for Healthcare Research and Quality, Rockville, MD. http://www.hcup-us.ahrq.gov/reports/statbriefs/sb196-Readmissions-Trends-High-Volume-Conditions.pdf. 1 Hines AL, Barrett ML, Jiang HJ, Steiner CA. Conditions With the Largest Number of Adult Hospital Readmissions by Payer, 2011. HCUP Statistical Brief #172. April 2014. Agency for Healthcare Research and Quality, Rockville, MD. https://www.hcup-us.ahrq.gov/reports/statbriefs/sb172-Conditions-Readmissions-Payer.pdf. Accessed October 22, 2015. 2 Minott J. Reducing Hospital Readmissions. Washington, DC: Academy Health; November 2008. http://www.academyhealth.org/files/publications/ReducingHospitalReadmissions.pdf Accessed June 12, 2015. 5 Boccuti C, Casillas G. Aiming for Fewer Hospital U-turns: The Medicare Hospital Readmissions Reduction Program. Menlo Park, CA: The Henry J. Kaiser Family Foundation; January 2015. http://kff.org/medicare/issue-brief/aiming-for-fewer-hospital-u-turns-the-medicare-hospital-readmission-reduction-program/. Accessed June 12, 2015. 6 Boccuti C, Casillas G. Aiming for Fewer Hospital U-turns: The Medicare Hospital Readmissions Reduction Program. Menlo Park, CA: The Henry J. Kaiser Family Foundation; January 2015. http://kff.org/medicare/issue-brief/aiming-for-fewer-hospital-u-turns-the-medicare-hospital-readmission-reduction-program/. Accessed June 12, 2015. 7 Thorpe JH, Cascio T. Medicare Hospital Readmissions Reduction Program. Legal Notes. 2011;3(4):1-4. http://www.rwjf.org/content/dam/farm/reports/issue_briefs/2011/rwjf71483. Accessed June 12, 2015. 8 Agency for Healthcare Research and Quality. HCUPnet Web site. http://hcupnet.ahrq.gov/. Accessed June 29, 2015. 9 HCUP Clinical Classifications Software (CCS). Healthcare Cost and Utilization Project (HCUP). Healthcare Cost and Utilization Project. Rockville, MD: Agency for Healthcare Research and Quality. Updated November 2014. http://www.hcup-us.ahrq.gov/toolssoftware/ccs/ccs.jsp. Accessed January 7, 2015. 10 Centers for Medicare & Medicaid Services. Measure Methodology. https://www.cms.gov/Medicare/Quality-Initiatives-Patient-Assessment-Instruments/HospitalQualityInits/Measure-Methodology.html. Accessed October 1, 2015. 11 Boccuti C, Casillas G. Aiming for Fewer Hospital U-turns: The Medicare Hospital Readmissions Reduction Program. Menlo Park, CA: The Henry J. Kaiser Family Foundation; January 2015. http://kff.org/medicare/issue-brief/aiming-for-fewer-hospital-u-turns-the-medicare-hospital-readmission-reduction-program/. Accessed October 1, 2015. 12 Agency for Healthcare Research and Quality. HCUP Cost-to-Charge Ratio (CCR) Files. Healthcare Cost and Utilization Project (HCUP). 2001-2011. Rockville, MD: Agency for Healthcare Research and Quality, Rockville, MD. Updated December 2014. http://www.hcup-us.ahrq.gov/db/state/costtocharge.jsp. Accessed January 7, 2015. 13 U.S. Bureau of Economic Analysis. National Income and Product Account Tables, Table 1.1.4 Price Indexes for Gross Domestic Product. http://www.bea.gov/iTable/iTable.cfm?ReqID=9&step=1#reqid=9&step=1&isuri=1. Accessed October 13, 2015. 14 For additional information about the NHEA, see Centers for Medicare & Medicaid Services (CMS). National Health Expenditure Data. CMS Web site May 2014. http://www.cms.gov/Research-Statistics-Data-and-Systems/Statistics-Trends-and-Reports/NationalHealthExpendData/index.html?redirect=/NationalHealthExpendData/. Accessed January 7, 2015. 15 American Hospital Association. TrendWatch Chartbook, 2014. Table 4.2. Distribution of Inpatient vs. Outpatient Revenues, 1992-2012. http://www.aha.org/research/reports/tw/chartbook/2014/table4-2.pdf. Accessed January 7, 2015. 16 The 2013 NRD available for purchase through the HCUP Central Distributor includes the data element for the primary expected payer but not the data element for the secondary expected payer. Internet Citation: Statistical Brief #196. Healthcare Cost and Utilization Project (HCUP). November 2015. Agency for Healthcare Research and Quality, Rockville, MD. www.hcup-us.ahrq.gov/reports/statbriefs/sb196-Readmissions-Trends-High-Volume-Conditions.jsp.